BACKGROUND: Post-operative nausea and vomiting (PONV) is a common complication following LRYGB which can lead to a longer hospital stay. Anti-emetics currently used are not completely effective. Aprepitant, a new class antiemetic, has been shown to reduce the incidence and severity of PONV as well as the length of stay in patients undergoing abdominal and orthopedic surgeries. In combination with corticosteroids and ondansetron, it has been used with good success in reducing the incidence of chemotherapy-induced nausea and vomiting. 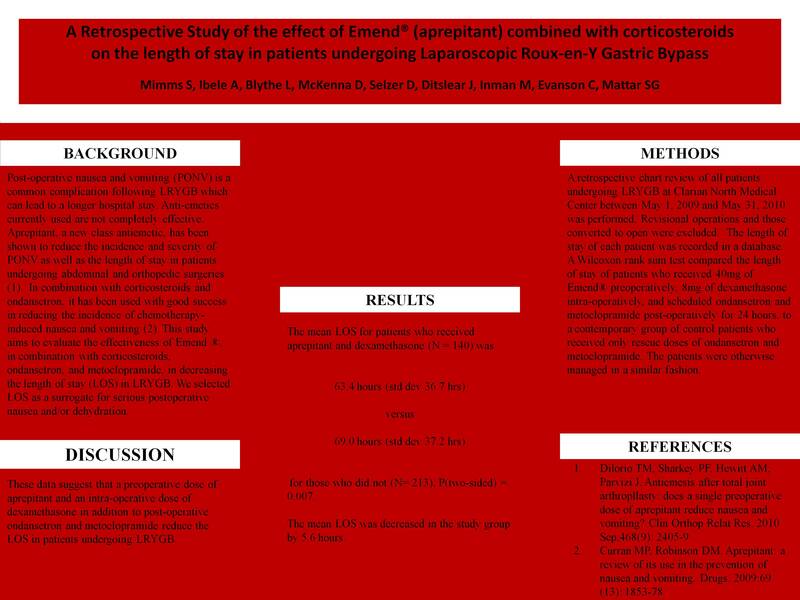 This study aims to evaluate the effectiveness of Emend ®, in combination with corticosteroids, ondansetron, and metoclopramide, in decreasing the length of stay (LOS) in LRYGB. We selected LOS as a surrogate for serious postoperative nausea and/or dehydration. Methods: A retrospective chart review of all patients undergoing LRYGB at Clarian North Medical Center between May 1, 2009 and May 31, 2010 was performed. Revisional operations and those converted to open were excluded. The length of stay of each patient was recorded in a database. A Wilcoxon rank sum test compared the length of stay of patients who received 40mg of Emend® preoperatively, 8mg of dexamethasone intra-operatively, and scheduled ondansetron and metoclopramide post-operatively for 24 hours, to a contemporary group of control patients who received only rescue doses of ondansetron and metoclopramide. The patients were otherwise managed in a similar fashion. Results: The mean LOS for patients who received aprepitant and dexamethasone (N = 140) was 63.4 hours (std dev 36.7 hrs) versus 69.0 hours (std dev 37.2 hrs) for those who did not (N= 213), P(two-sided) = 0.007. The mean LOS was decreased in the study group by 5.6 hours. Conclusion: These data suggest that a preoperative dose of aprepitant and an intra-operative dose of dexamethasone in addition to post-operative ondansetron and metoclopramide reduce the LOS in patients undergoing LRYGB.